After 9 years of service, Amazon has decided to shut us down. NovelRank can no longer track sales rank data. If you found value in this free service, consider donating. After 9 years of service, Amazon has decided to shut us down. NovelRank can no longer track sales rank data. If you found value in this free service, consider donating. In August 2018, Amazon canceled our affiliate accounts as well as our API access (how we collected sales rank data), stating we violated their Code of Use. "Specifically, you are using our Content for reasons other than sending end users and sales to the Amazon Site." I know this is heartbreaking for those who have come to depend on the service. It's also heartbreaking for me as this was my job, my income, and it happened weeks after my wedding (first marriage!). I'm just as disappointed as you probably are. Below I've outlined what happens next and answer some common questions I've received since this was first announced. If you've found this free tool useful, please consider a donation to me personally: Donate. There is no set asking price as it is dependent on what assets are included: domain, code, consulting, etc. The value is in the positive brand image, SEO, and deep history. Just email me to start a conversation. Please note that the service cannot simply be restarted without extreme risk of a shutdown by Amazon. Will the service come back? Is there a competitor you can recommend? I was the last one standing and also the largest target; I can't recommend another tracking website. Businesses can still purchase the Enterprise software and run it privately. How long do I have to download my book's data? You should download your sales and sales rank history as soon as possible. However, while I still control the site, the data will be available till January 1, 2019. I have a freemium small business inventory, customer, and invoice service available called ReadySum. For those who play tabletop roleplaying games, like Dungeons & Dragons, I have a service for you as well, called HeroMuster. Website improvements: Loading speed, User eXperience (onboarding, accessibility, retention), and design recommendations. Business improvements: Efficiency, growth strategies, customer engagement, and customer acquisition. I don't know exactly. I'm trying to grow the above businesses as well as job hunting. Colorado rent is really expensive, but I'm fixed here for now due to my wife's growing food business. We did it on a $4000 budget (including her dress!) and it was magical. 50 friends and family gathered at a Colorado state park. 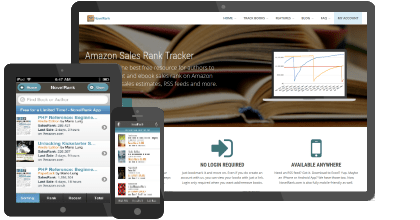 NovelRank was created by Mario Lurig to be the easiest online tool for authors tracking Amazon sales rank across the world. You can get an idea of actual sales as well as the effect of marketing efforts in near-real time.